For those unfamiliar, steampunk combines elements of science fiction and fantasy overlaying elements of the Victorian era and industrialization, especially steam power. Steampunk literature features futuristic innovations as Victorians may have envisioned them. Fictional machinery that H. G. Wells or Jules Verne invented for their novels are models for steampunk. The steampunk genre presents a romantic idealization of the 19th century and an escape from modern realities. 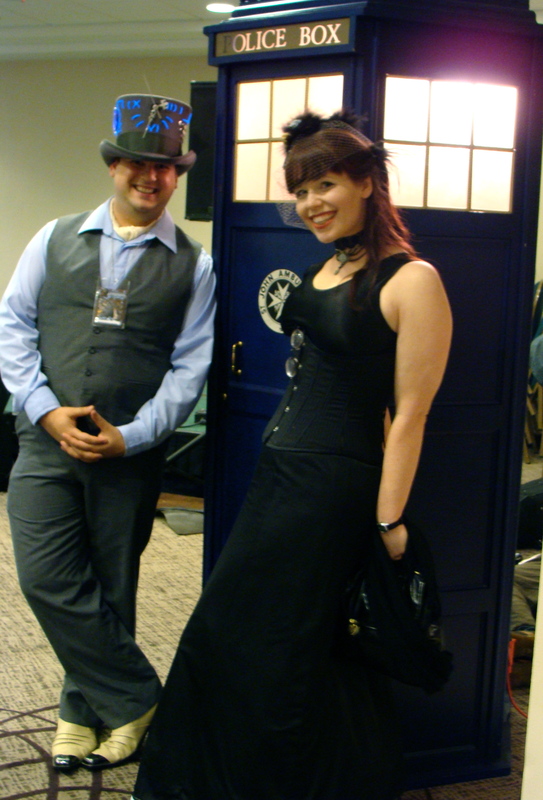 Steampunk culture values a more formal approach to manners and dress. So how does the punk fit into this retro-genteel world? Punk loosely references the cyberpunk style with anti-establishment sentiments. Various sub-cultures of punk have evolved since the late 1960s, but it seems the common thread of non-conformity weaves through most of followers’ ideology. While famous writers often receive all the credit for futuristic insight, other writers deserve credit for their insightful predictions. A friend just happened to show me a well-worn book that was recycled into a depository for redistribution and sale of no longer needed reading materials. 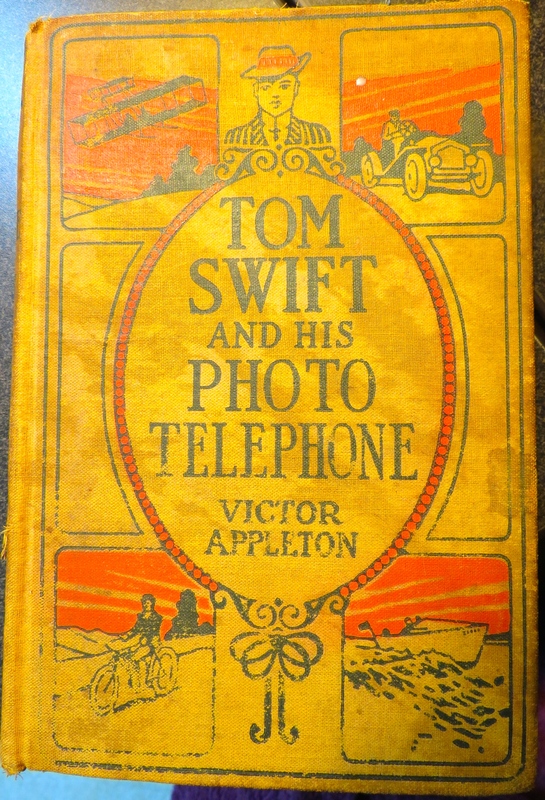 The title: Tom Swift and his Photo Telephone by Victor Appleton, who published this novel in 1914. The telephone had been around for 35 years. Favorite inventions featured in steampunk art and stories are the airships, submarines, flying machines, analogue computers and anything steam-powered. In this novel, part of the plot involves thieves stealing Tom’s airship. Alongside these representations, many gadgets accompany the story lines, such as time-travel weaponry, goggles, industrialized jewelry, and assorted timepieces. 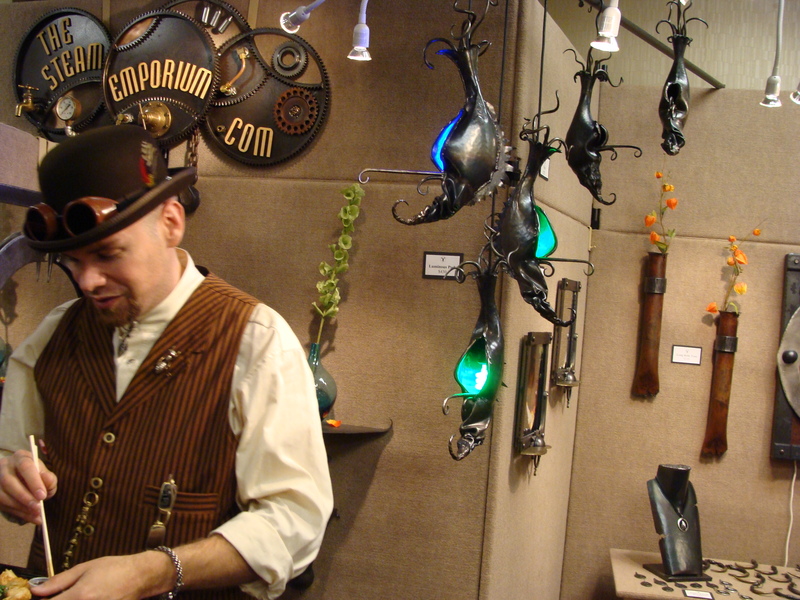 Steampunk encourages the imagination toward alternative technologies, frequently incorporating the Victorian aesthetic while thinking about what “punk” might bring to speculative future. 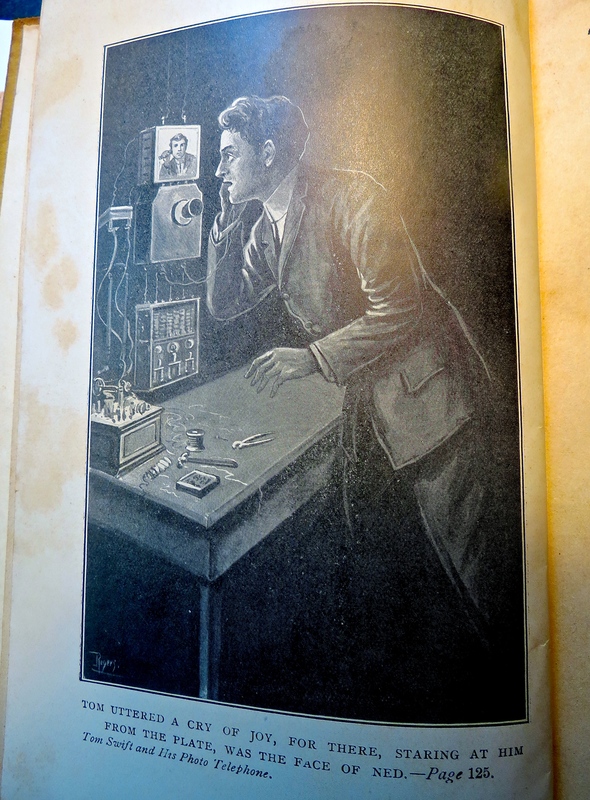 Drawing from this novel, another invention can be added to the collection: the photo telephone. Although Appleton’s novel is rarely included in the lists of science fiction predictions that came true, I think it is time to give this author’s writing in the post-Victorian era credit for providing a glimpse into future technologies. According to The Weather Channel, Philadelphia is experiencing the third snowiest winter ever on record. No surprise to us, however, with another three inches to shovel off the driveway this past week. The total for this season so far: 58.4 inches, all of which had to be removed from our drive and walkway. Because our drive is shaded, the snow freezes making a nice, slick patch of ice to negotiate. On the upside, I like practical exercise. For me, going the to a gym is tedious, but I welcome the chance to put effort toward yard work, which offers the satisfaction of having something to show for all that effort. This explains my resistance to purchasing a snow blower. Snow blowers, which are noisy and take up room in the garage, have to be maintained and cost money to run. 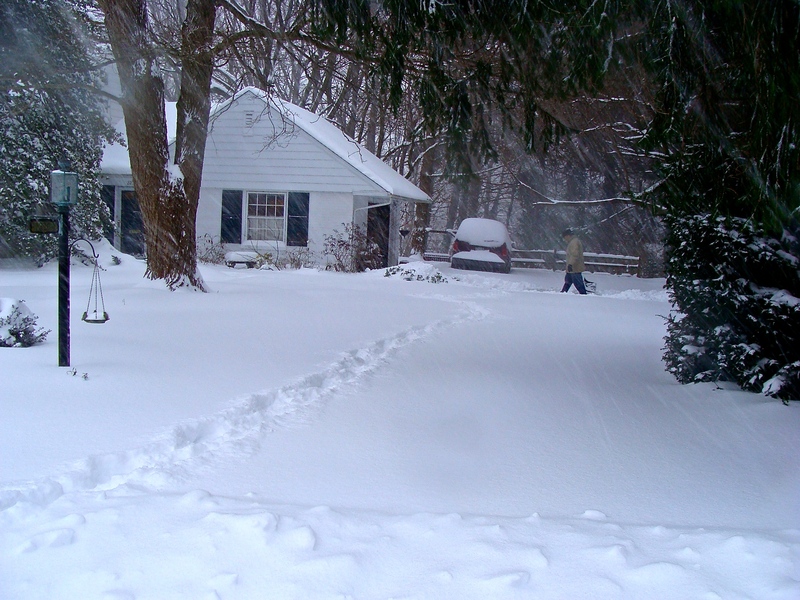 Shoveling seems to be the perfect answer to winter exercise. We abide by all the rules of physical exertion by taking frequent rest periods, drinking plenty of water, using small shovel loads, and pushing the snow rather than lifting it. Our two shovels have good designs, with handgrips with ergonomic placement. Our box arrived several days later, and within a couple hours we managed to put together the parts and complete the assembly. 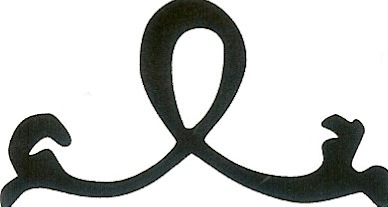 The height of the handle can be adjusted to make a more comfortable position. The snow on our drive had turned icy and crunchy, and I thought the shovel might have a difficult time plowing through the hard crust. No need to worry, the machine dug in and lifted the snow away. 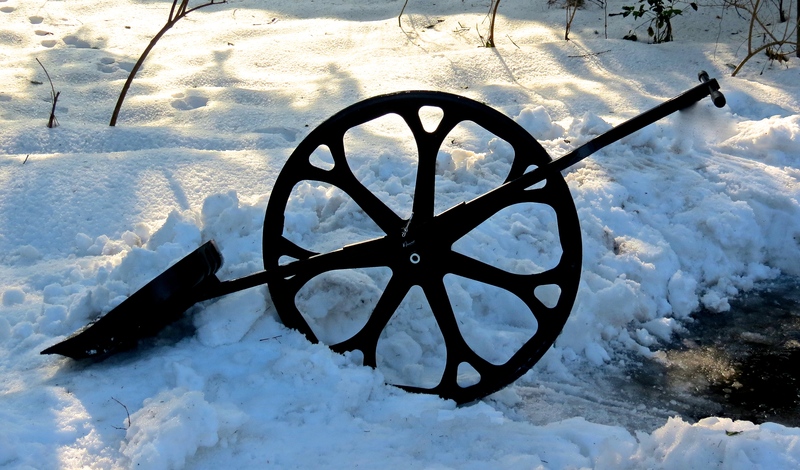 Since our drive is wide, the wheel allowed us to easily carry the snow off to the side. 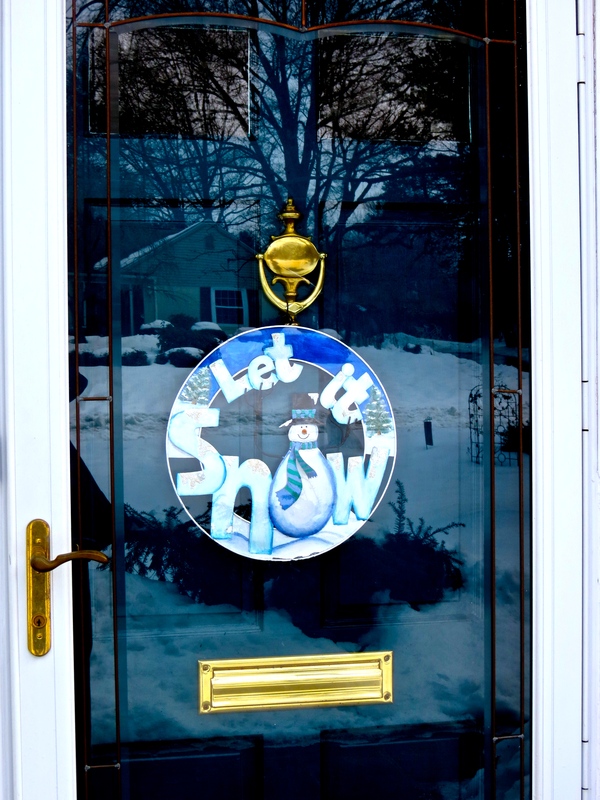 In November, I had placed the “let it snow” decoration on our front door, hardly suspecting that perhaps I might be tempting the muses with a call for continuing snow throughout the winter. But now we are snow warriors, armed with our Snow Wovel, ready to conquer whatever the the next storm brings, while getting some exercise and doing our part for the environment. Awhile back I wrote a post on steampunk and the 1987 television program, Beauty and the Beast, which carried many of the steampunk themes. The costumes, setting and the intersection of fantasy with reality connected the program to the steampunk genre, combining science fiction and fantasy, with overlaying elements of the Victorian era and industrialization, especially the influence of steam power. In this post I add a bit more to the discussion on steampunk with reflections on a graphic novel, pottery and photography. Jared Axelrod and Steve Walker have written and illustrated a cleaver graphic novel with a steampunk setting: The Battle of Blood and Ink. 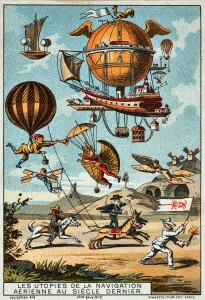 An entire city flies through the sky, which is not an unusual scenario in steampunk literature, where often castles travel through the universe. Ashe, the courageous heroine, sets out on an adventure to discover the secret of how their government officials capture the energy to fly the city. Ashe publishes a newspaper, The Lurcker’s Guide to Amperstam, proving that the pen is mightier than the sword. Ashe wears an outfit that includes steampunk fashion elements: a corset, bustle and amulet. Steampunk breaks from the Victorian aesthetic allowing creative takeoffs to flourish. Her skirt is short for Victorian standards, and the boots are substantial, appropriate for a high-flying crusading reporter. Ashe is a woman who embarks on a journey into a world unlike anything we’ve ever seen and is dressed for the part. This photograph recreates Ashe’s steampunk dress and backdrop with a remarkable likeness to the graphics in the book. Ashe and her pilot, speed through the clouds on an airship that models steampunk apparatus, replete with propellers and mechanical engine. Steampunk’s approach to technology combines futurist possibilities with 19th century machines. Flying contraptions have a long history in the pre- and post-Victorian era, representing the possibilities of new adventures through technological innovations, and in this case, with Victorian flourishes etched on the sides. Today artists capture the visual aspects of steampunk ideas in pottery and sculpture. These industrial-inspired ceramics can be adorned with gears, keys, chains, pipes, clocks and a variety of industrial antique components. In most of these pieces I used metallic black glaze, which leaves a golden metallic sheen. By adding the elements of steampunk, the pieces become lively and interactive. Displayed on Victorian needlework, the industrial pottery juxtaposes the softness of delicate fabric. Steampunk images are easy to find, but capturing them in an artistic view proves to be more challenging. Here are several photographs that capture some aspect of steampunk, whether it is the nuts and bolts on the Eiffel Tower or a battered industrial machine left in the ruins of an old mill. Have you been inspired in some way by the steampunk themes? For those unfamiliar, steampunk combines elements of science fiction and fantasy overlaying elements of the Victorian era and industrialization, especially the influence of steam power. Steampunk literature features futuristic innovations as Victorians may have envisioned them. Fictional machinery that H. G. Wells or Jules Verne invented for their novels are models for steampunk. The steampunk genre presents a romantic idealization of the 19th century and an escape from modern realities. Steampunk culture values a more formal approach to manners and dress. So how does the punk fit into this retro-genteel world? Punk loosely references the cyberpunk style with anti-establishment sentiments. Various sub-cultures of punk have evolved since the late 1960s, but it seems the common thread of non-conformity weaves through most of followers’ ideology. Steampunk fashion models after the imagery created in the genre’s literature. Victorian attire provides the basic starting place, and the clothing can mimic outfits of an explorer, officer, scientist, gazetteer or just something any one of Dickens’ characters might have worn. Suits and vests and military coats are favorite apparel items associated with the steampunk culture. Especially note the gentleman’s hat, for this is where Victorian meets the technology. The hat, which is electrified, tells time! One of the most delightful aspects of steampunk is that wearer and the viewer both experience enjoyment over the inventions. Steampunk fashion undergoes constant change as fans naturally incorporate diversity in style, making each outfit unique. 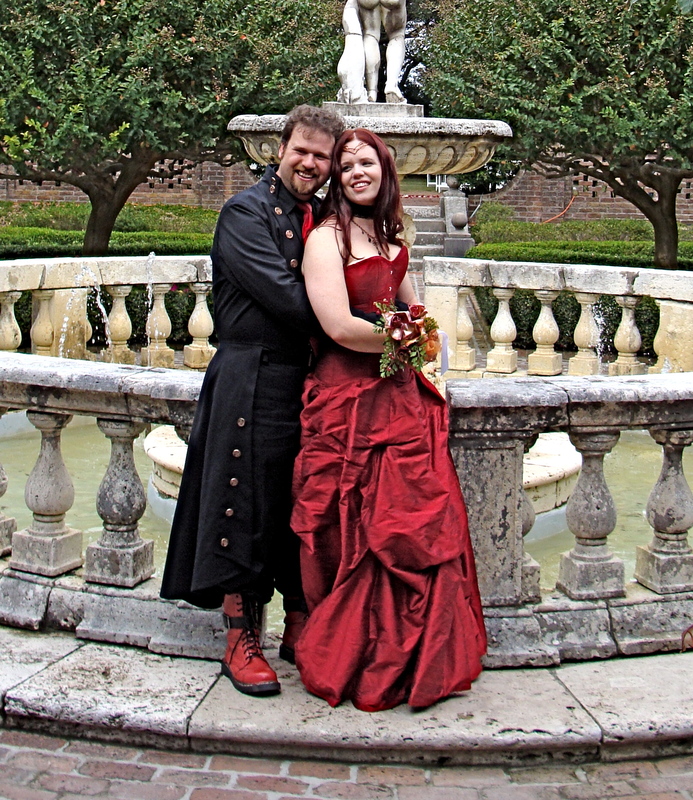 Below are several examples of steampunk elements in wedding attire. 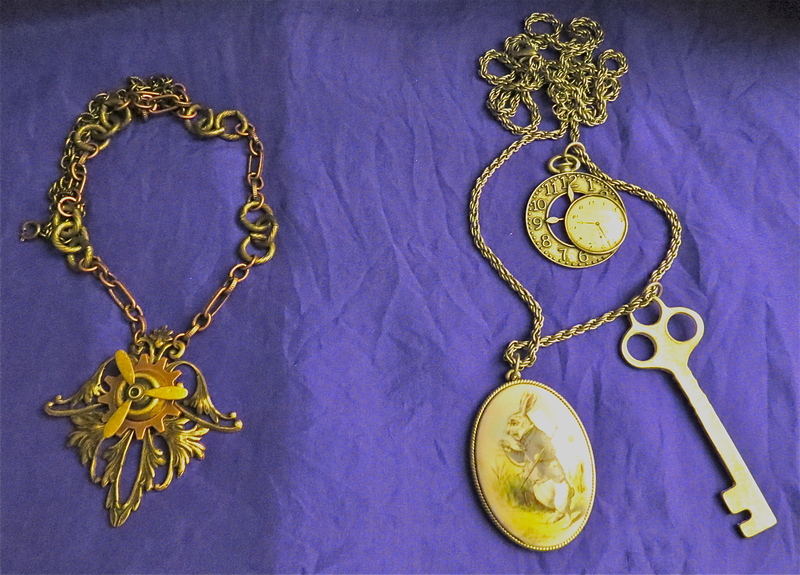 Jewelry mimics mechanization, and pieces feature chains, clocks, gears, keys or propellers. Sometimes, semi-precious stones are set in the piece. Steampunk jewelry has a salvaged look avoiding bright metals or colors. Copper, bronze, silver or brass better reflect an antique appearance. Claiming to be the greatest steampunk festival in the world, Yesterday’s Tomorrows: Steampunk World’s Fair was held in Somerset, New Jersey, in May 2011. A lovely assortment of costumed people filled the rooms, and stores displayed everything from electrified gadgets to elegant jewelry. CBS News did a short piece on the Fair, and about 20 seconds into the video a report interviews a certain young woman above about her “supportive” apparel. 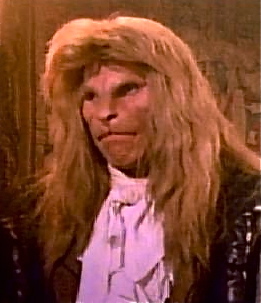 Beauty and the Beast: The Television Series ~ Link to Steampunk? 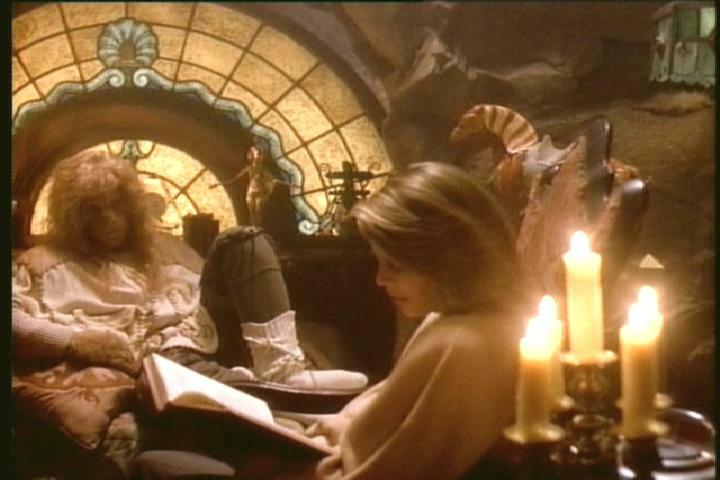 Before I ever hear the word steampunk, back in 1987 a new television series appeared on the scene that had all the elements of steampunk, Beauty and the Beast, starring Ron Perlman and Linda Hamilton. The clothing, setting and the intersection of fantasy with reality all connect the program to the steampunk genre. In this telling of the tale, New York City sets the stage for the drama with Catherine, the beauty, residing “where the wealthy and powerful rule” and the Beast living below the subways in a tunnel community. Many elements of the program offer evidence of the link to steampunk. The Beast’s clothing could best be described as Victorian–he did wear a cape, after all. Sometimes his outfits included a large metal or leather belt, a break from the straight Victorian look. His home in the tunnel world consisted of arched chambers of cinder blocks and cement, and pipes lined the walls. These stark industrial scenes contrasted with his room, lite by Tiffany-style lights and candles with books piled high, and where a huge semi-circular stained glass window served as a backdrop. Bronzed statues, old-world globes, and even a huge time piece contributed to the room’s ambiance. As Catherine leaves the tunnels the first time she experiences this new world, Vincent takes her hand as she jumps over a crevice filled with steam rising from below. In the first episode, “Once Upon a Time in New York City,” Vincent reads to Catherine from Charles Dickens’ Great Expectations, a popular 18th century novel. We’re below the city, below the subways. 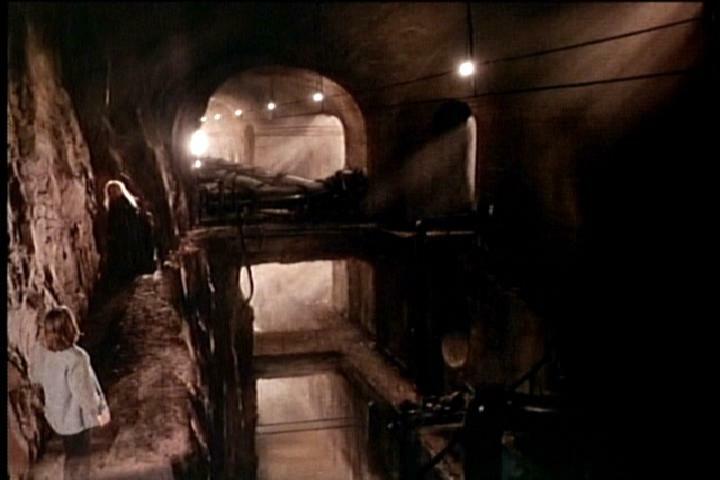 There is a whole world of tunnels and chambers that most people don’t even know exists. There are no maps to where we are. It’s a forgotten place. But it’s warm and it’s safe, and we have all the room we need. So we live here and we try to live as well as we can, and we try to take care of each other. Vincent cares for Catherine, who is left for dead after thugs attack her. After her stay in the tunnels, Catherine transforms from a wealthy socialite and corporate lawyer to a position of assistant district attorney where she believes she can help people. Dedicated by its devoted fans. Every year the fan community holds a cyber “Winterfest” that can be found here. Fans have created web sites, art, literature and hundreds of videos on YouTube. The creators of the show must have had some sense of the magic that could be created by a time-space warp: folks living in another era right beneath the feet the power mongels. The audience enjoys the prolonged romantic courtship of Catherine and Vincent that allows the heroine to pursue her own goals and ambitions without the constraint of a social relationship and its complications in the modern world. Vincent guides both Catherine and the viewer through a labyrinthine of chambers and tunnels, away from the impersonal and greedy world to a community that offers companionship, warmth, and comfort in the form of a subterranean sanctuary with a bit of Victorian flare. 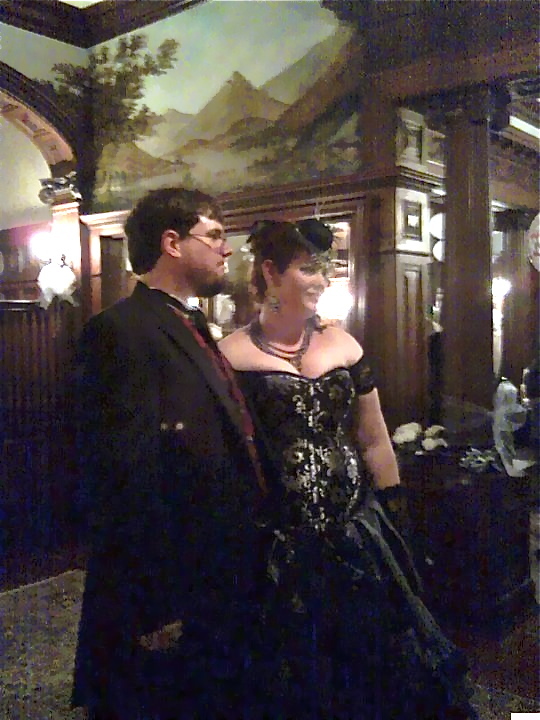 So whether it be finding an accessory from the Victorian age or watching favorite episodes of B&B, I’ve enjoyed the trip as a passenger on that steampunk train.